Irish-themed slots are ten-a-penny these days: whether it’s the Leprechaun love-in of Playtech’s Plenty O’ Riches slot or the Expanding Wild madness of Shamrock Isle, the Celtic-tinged game from Rival Gaming, slots fans chasing pots of gold have a seemingly endless supply of games to choose from. Amaya have joined the ever-growing legion of slots designers adorning their screens with green, four-leaf clovers and Celtic bands. 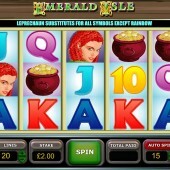 Emerald Isle is a 5-reel, 20-payline online video slot with plenty of Celtic-styled 10-through-Ace symbols, shamrocks, and Irish beauties to guide you to that pot of gold. The leprechaun is the big payer, bagging you a potential top whack of $30,000 if you hit five symbols across the reels while betting the maximum amount. He’s also the game’s Wild, substituting for all symbols other than the Scattered Rainbow. Land three colorful Rainbow symbols across the reels anywhere and you’ll earn yourself 10 free spins. They’re no ordinary spins, however, carrying a tasty 3x multiplier. And what’s more, they can be re-triggered if you hit more Scatters during the bonus round. The leprechaun isn’t finished with giving out tasty wins there, however. Land him on reels 1 and 5 and you’ll activate the game’s second bonus round. Essentially a (peat) bog-standard Pick Me Bonus round, simply choose three matching symbols from behind the clover-leaf covered doors and earn yourself a nice prize. So, will the leprechaun be smiling on you with this game? Emerald Isle may not have quite the "Wow Factor" of its Irish rivals like Plenty O’ Riches, but Amaya obviously didn’t want to feel left out. The jackpots on offer are fairly impressive, so there’s definitely something to aim for for the savvy slots player. 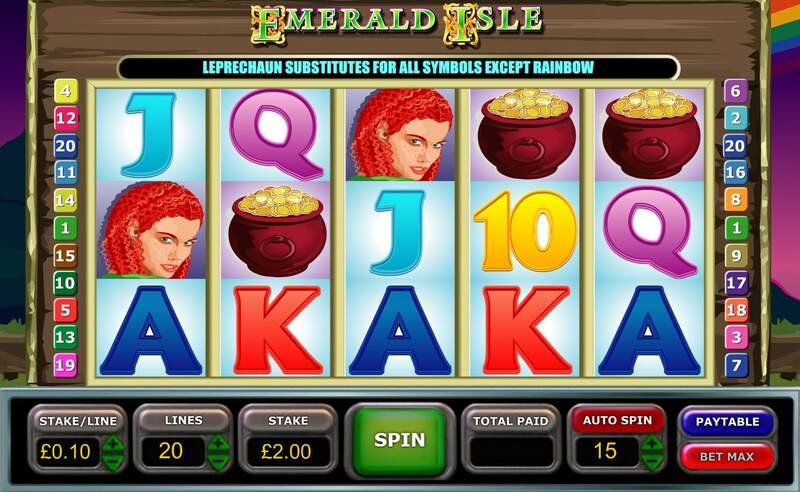 While slots gamblers chase the fabled luck of the Irish, slots featuring gold and leprechauns aren’t going to go away; Emerald Isle is merely another fair addition to the roster.